Goodbye Siemens: Now Independent, Can Osram Catch Up in the LED Race? Osram needs to execute its restructuring plan while attracting investors. Speaking to the Wall Street Journal, an unnamed German fund manager summed up the mood among some investors who were preparing for Siemens to divest from 80 percent of Osram, the second biggest lighting company in the world. "If Siemens doesn't want to own Osram, why should it be attractive to outside investors?" That’s the question some were asking in the lead up to Monday, when shares of Osram Licht AG officially began trading on the German stock exchange. It was roughly two years ago when Siemens decided to divest from its lighting division, which was facing intense pressure from Chinese LED producers. But Siemens halted the public offering of Osram in the summer of 2011, when the European debt crisis was rocking stock markets. Osram finally set out on its own yesterday after Siemens offered investors one share for every ten Siemens shares they owned. That strategy was considered much less volatile than selling the stock to the rest of the public. Osram’s restructuring plan will be crucial for its competitiveness. The company, which is the largest pure-play lighting manufacturer in the world, is working to adjust to a rapidly changing and increasingly competitive lighting market. As it contends with emerging Chinese players and established lighting heavyweights like Cree, LG, Philips and Samsung, Osram will need to continue investing in new LED products and drive down costs. 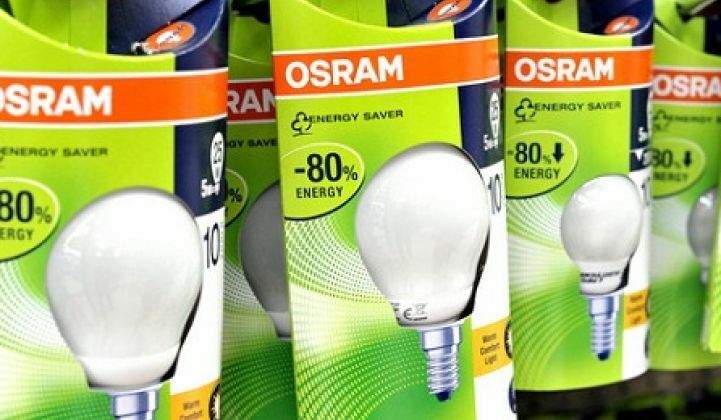 Although LEDs represent one quarter of Osram’s lighting sales, some analysts estimate that the company will need to invest another $1 billion in the technology to keep up with its competitors. However, that investment will need to come as Osram shutters eleven plants worldwide by 2014, cutting 12 percent of its workforce. The company has already eliminated 5,000 workers and plans to cut 8,000 workers in total as part of its effort to save $1.2 billion by 2015. Rather than make the needed capital investments to improve Osram’s competitiveness, Siemens decided to make it an independent company. Investors are watching closely, wondering if Siemens’ decision to get rid of Osram spells bad news for the lighting company’s fortunes. But with Osram’s restructuring plans already underway, UBS analysts said today they believe the company will drive toward “growth and profitability” and is “well placed to benefit” from the broader shift to LEDs.